Yesterday the Holy Father received in audience Archbishop Piero Marini, the previous papal MC (Marini primo). In 2007 after 2 years as Benedict XVI’s MC, and 18 years before that as Blessed John Paul II’s, Marini primo was moved to a curial position, and in his place a young Genovese monisgnore was appointed, Guido Marini (Marini secundo). There are many around who resent money being spent on the liturgy, with the inevitable refrain that it would be better spent on the poor. Apart from being a simplistic argument, and one that is not easily reconcilable with our Lord’s own words (Matt 26:6-13 comes to mind), it is often found to be contingent on the way it is being spent. 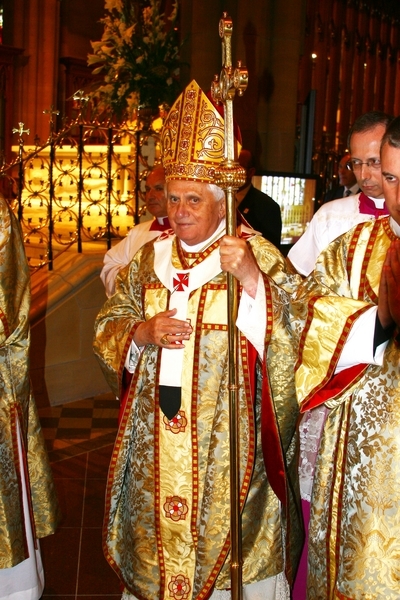 If for modern vestments or architecture, then it can be praised as modern, part of adapting Christianity to the contemporary society and taste &c, and any objections quickly forestalled; but if for traditional-style vestments, buildings or fitments, then it becomes costly indulgence in nostalgia, “dressing up” &c. Monasteries are not immune from it. It is a mindset wholly alien to a true Christian spirit, and one certainly incomprehensible to eastern Christians, not least those who live in much poorer countries than ours. They tend to sacrifice much for the sake of their liturgies. It is a traditional vestment which does not slavishly ape any one period. 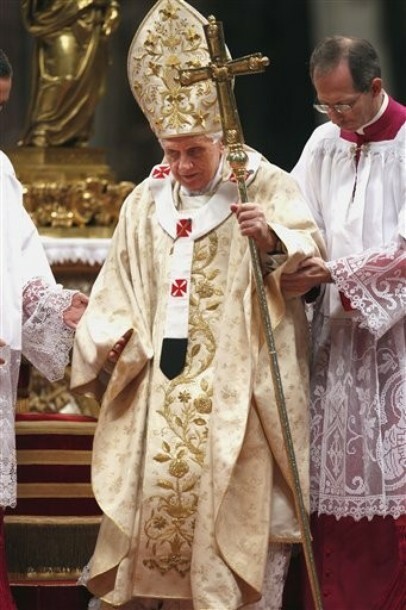 It is a full cut chasuble of unostentatious beauty. Its use of the tau cross I find particularly attractive. The Studio makes vestments of many styles, always with an eye to beauty, good taste and quality. If I had the money I would stock our meagre sacristy with Michael’s work without a second’s hesitation! When I saw this news on another blog, I wondered whether the meeting had anything to do with Archbishop Marini’s current post as president of the Pontifical Committee for International Eucharistic Congresses – maybe (or hopefully) the pontiff wanted to meet Marini primo simply to discuss the state of planning for World Youth Day or some other international event that could be in the offing. Well, that did cross my mind but I am not aware of any urgent need that the PCIEC might have to see the pontiff so soon. Is WYD actually a responsibility of PCIEC? If so, you are probably right, If not…. mmmm. In any case, I do want to see Marini secundo stay in his current role for years to come. I rather doubt that Marini primo would return to his former office – one doesn’t often see retreads in that position, and he’s also getting old – but at the same time, if the pope wanted a new MC, perhaps he would seek Piero’s advice about possible candidates. Given that he has barely seen anyone so far in his short pontificate, it is notable that Marini, in a relatively junior position, has had a personal audience already with Francis. Retreads can come to pass if the term envisaged is not too long. Maybe Marini primo would be a temporary guy till Francis finds the man he wants. Or, as you say, maybe he wants his advice. But given the Secretary of State position should surely have overwhelming priority, it is just plan confusing! that blog is a treasure trove – medieval vestments are glorious ! 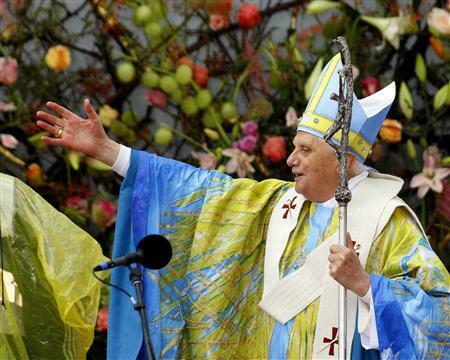 What did Francis mean when he said “Carnival’s over” when shown the items selected for him to wear after his election? Serious question – If Piero Marini is given CDW, would it be sinful to pray for a very short pontificate. 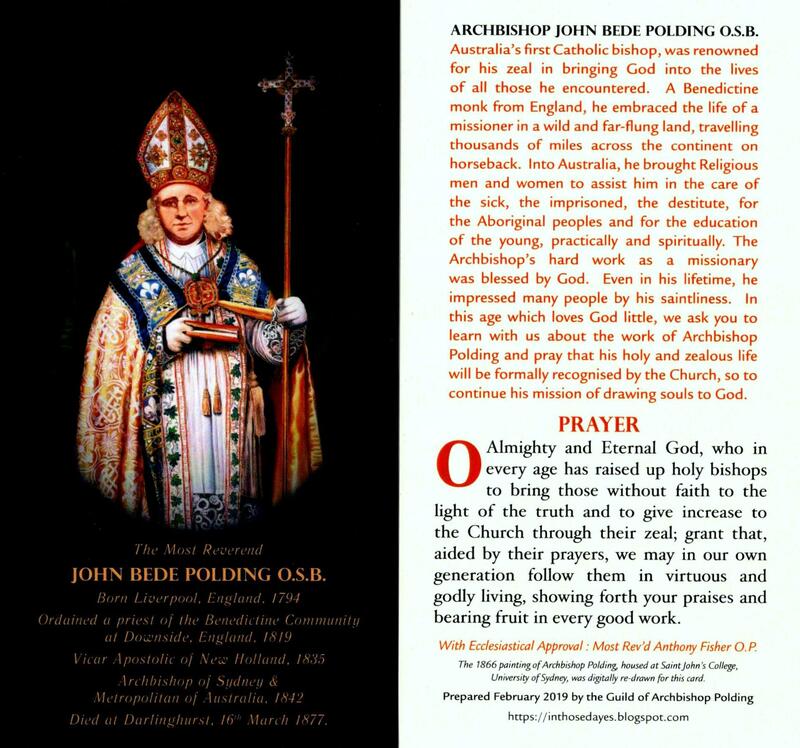 Well I can’t see him in any other discastery apart from CDW? He’s got no experience in State for example. It’s also telling that Archbishop Marini was seen before Card. Llovera. Sandro Magister reported just a few days ago that +Llovera was one of the discastery heads who were not completely honest with B16 and tried to cover up the approval of the Neo-Cat liturgy. Whatever his thoughts are on the liturgy, Pope Francis is unlikely to have viewed that action favourably. Good point. Francis will want fidelity. But Marini primo? Goodness, if you are right about his being promoted to CDW I will owe you a pint of your preference! Haha – this is definitely one time I hope I am NOT proven right. I’m just fearing the worst as usual! Speaking of – it would be nice to share food and drink one day hopefully? Always happy to break bread and spill some juice with a friend in the Lord! Also – just seeing that first picture of B16 I am reminded again of how very humble he was. I can’t imagine very many priests would wear that if that were put out for them without asking for something else first, or at least saying, like Pope Francis with the mozetta, that he’d rather not. Thankfully the real carnival (for now) is over! Amen! Long may we be spared the return of that carn-evil. Benedict indeed was (is) a humble man, more so than me. I have had to wear the occasional shocker for Mass, but I could not have coped with with the chasuble in the first picture. My pride would have prevented me. But Benedict wore what he was told. Strange thing about humility of the truest sort – we do not recognise it till long after we have seen it. True humility escapes the notice of the masses. I especially agree with the comment on humility. Recent events have had a positive impact in that a lot more people are considering what constitutes genuine humility; and there seems to be a recognition that humility takes different forms. As it is an internal disposition, it is possible for both Francis and Benedict to be humble, yet for their approach to be different. Having said that, I’m praying that Francis will keep that other humble man, Marini number two, in place! Hi Neil. Thanks for your comment. I have said before that what shows that Pope Francis is not playing to the cameras is that he is acting consistently with his practice as Archbishop of Buenos Aires. Thus Francis seems to be a man of principle who plans to remain so. 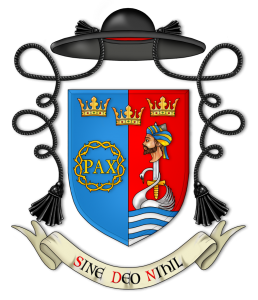 And to pray for the continued ministry at the papal elbow of Marini secundo is a worthy activity: his sort do not grow on trees and his work has been wonderful. And it is a tough job.